eXpress begins by using the time of repair, severity of failure and failure probability to develop a ranking of the failures that would have the greatest impact upon system safety and availability if prognostic tests were to be developed for those failures. 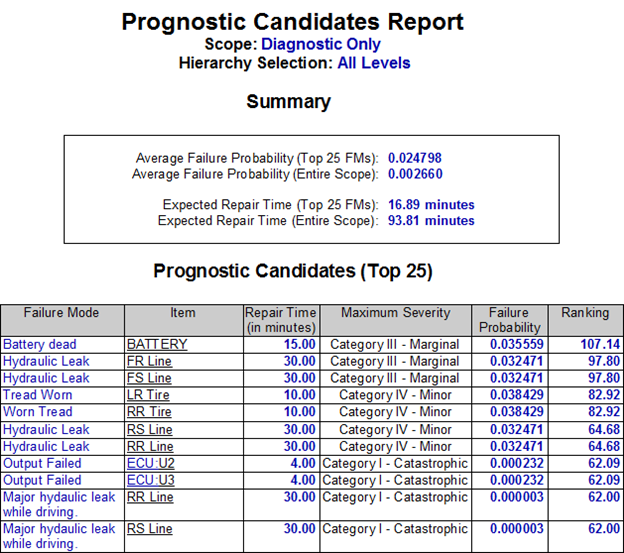 Prognostics are then added to the model as specialized tests which include a prognostic horizon during which the prognosis will occur prior to failure, a confidence that the prognosis will actually occur rather than fall through to detection using standard diagnostics, and a correctness that the prognosis will actually represent a true failure that will occur. An accuracy for the prognosis is then determined based upon whether the prognosis will be validated prior to repair. If now validation of the prognosis occurs prior to the repair, then the accuracy equals the confidence. However, if the prognosis of failure will first be validated prior to the repair then the accuracy equals the confidence multiplied by the correctness. Prognostics are used in eXpress diagnostics by selecting prognostic tests candidates and by selecting whether to include or exclude the prognosed failures in the diagnostic analysis. When included in the analysis, then the system detection and isolation numbers will be adjusted based upon the assumption that some credit for detection and isolation can be taken credit for by including the selected prognostic candidates. In this case, the prognostic test will appear at the start of the diagnostic flow since a prognosis, which occurs before failure, always occurs before normal diagnostic detection. When excluded from the analysis, then the system detection and isolation numbers will not be adjusted using the selected prognostic candidates. This setting is used when the required testability analysis cannot include prognostics. In this case, while the prognostics are still part of the flow they do not show up in the eXpress but can be used to generate a prognostic effectiveness report which is separate from normal testability analysis performed for diagnostics. The prognostic effectiveness report provides details to show what percentage of the total probability of the system failures will be prognosed within the specified net prognostic horizon. 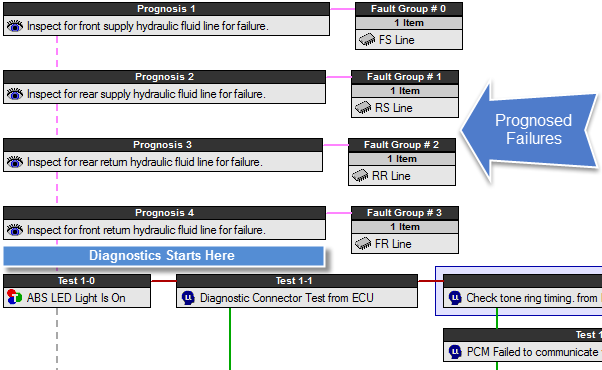 Since the corrective action for prognosed failures occur before a failure occurs, the corrective action mitigates the critical safety events in the fault tree analysis by reducing the likelihood of the critical event occur. 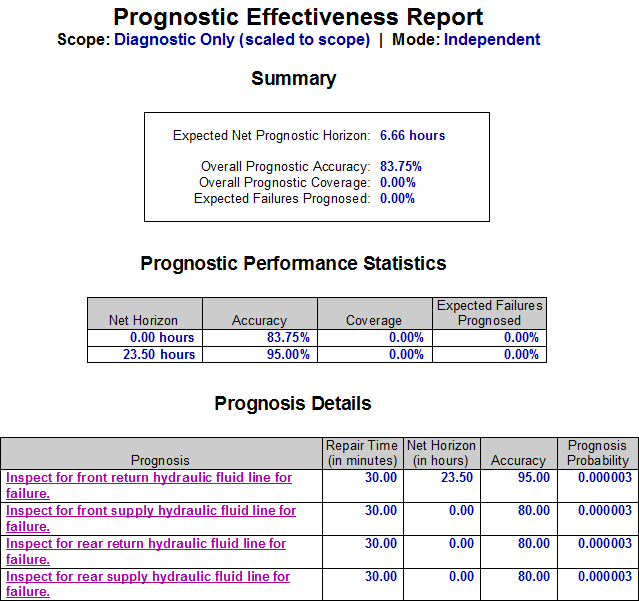 An eXpress diagnostic analysis that includes prognostics can be used to generate a fault tree analysis. When attached, the prognostics reduces the likelihood of the critical event from occurring.